Strike a pose: artist Guido van Helten with his mural of deaf dancer, Anna Seymour. Photo: Wayne Taylor. “Writing about music is like dancing about architecture,” musician Elvis Costello once said. Half that metaphor took a surprisingly literal form on a Melbourne wall this week. 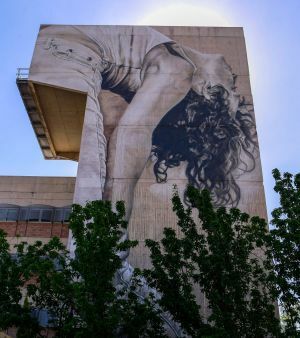 As part of a series of murals recently commissioned by Melbourne Polytechnic, artist Guido van Helten worked with profoundly deaf contemporary dancer Anna Seymour to create a striking seven-storey portrait. Van Helten, 30, travels the world making large, site-specific murals inspired by the way human stories interact with architecture. You’ll find his photo-realist portraits everywhere from the restricted zone in Chernobyl to his largest work to date, a series of grain silos in Brim, in Victoria’s rural north-east. Anna Seymour (left) in dance production Under My Skin with Luigi Vesca, Amanda Lever and Elvin Lam. Photo: Justin McManus. Guido van Helten’s mural in Windsor took five days to transfer to the wall using spray paint, acrylics, paint brushes and a large cherry picker. Photo: Wayne Taylor. This article first appeared in The Age on 28 January, 2017.